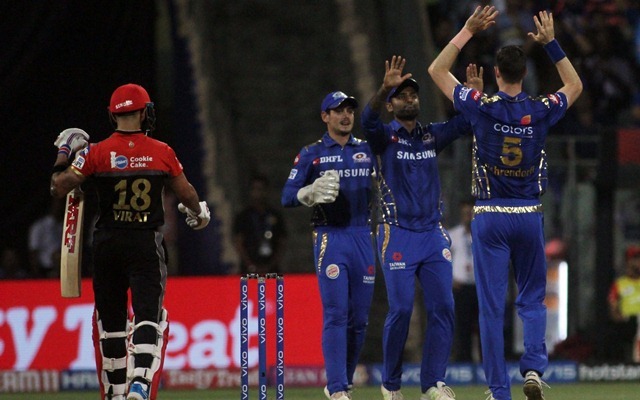 Just when RCB skipper Virat Kohli started believing he had an outside sniff, Hardik smashed Pawan Negi to all parts, yet again, to win the match for the Mumbai Indians. Mumbai Indians romped home to yet another convincing win at their fortress in Mumbai. They beat the Royal Challengers Bangalore in what turned out to be a relatively low-scoring encounter compared to the standards set by the Wankhede wicket. Chasing 171 for the win, MI took the run chase deep into the penultimate over to finish off the proceedings. A calm, collected Hardik Pandya was all that the hosts needed to tame the underperforming RCB unit. Earlier in the game, Mumbai Indians won the toss and opted to bowl first. RCB had the worst possible start they could think of as they lost their skipper and batting mainstay Virat Kohli early in the innings. It was the overseas duo of AB de Villiers and Moeen Ali that got the RCB’s ship sailing. Both batters scored valuable fifties in the innings to take the total to 171/7 in 20 overs. There were no other notable contributions from other players and wickets fell in clusters towards the end of the innings. Lasith Malinga finished with 4/31 in his spell. In the run chase, MI got off to a flying start with their openers Rohit Sharma and Quinton de Kock adding 70 runs off 43 balls for the first wicket. However, a flurry of wickets in the middle-order brought RCB back in the contest. Just when RCB skipper Virat Kohli started believing he had an outside sniff, Hardik smashed Pawan Negi to all parts, yet again, to win the match for the Mumbai Indians. Quinton de Kock had a good game with the bat. After having failed to come good in the first half of the league stages, the Proteas batter has come good in the last two matches. After his brilliant fifty in the previous match, De Kock backed it up with a timely 40 off 26 balls in this game. He hit five fours and two sixes during his stay at the crease and provided a brisk start to MI. Rohit Sharma is yet to score a big one in the 2019 edition of the IPL. His search did not end in this match either, and he failed to get going after getting a very decent start. He added 70 runs for the first wicket with Quinton de Kock. He largely played the supporting role for his partner and ended up with a 19-ball 28 to his name. Suryakumar Yadav seems to be having a templated season this year. He comes out to bat, hits a couple of good shots, then hits an excellent one to set the expectations high. Then, he suddenly faces a short downtime at the crease, following which he perishes to the scoreboard pressure. The storyline was the same in this match as well. Yadav scored 29 off 23 balls. Ishan Kishan managed to retain his place in the playing eleven for this match as well. The talented southpaw had failed to score well in the previous two outings he had for the team. In this match, he started off with some serious intent. He clobbered three maximums but then ended up getting dismissed a little too early. He scored a brisk 9-ball 21. Krunal Pandya had an excruciatingly painful stay at the crease with the willow in hand. He just could not get going after hitting an odd boundary. He scored 11 runs as he consumed 21 deliveries. Earlier in the game, he did not get a lot of chances with the ball either. In the only over that he bowled, he conceded 10 runs. Kieron Pollard arrived at the crease in the 18th over of the run chase. But he did not have to do anything, he did not get to face any ball as Hardik Pandya finished things off at the other end. However, his direct hit in the final over to dismidd De Villiers certainly led to RCB finishing with 10 runs less on the board. Hardik Pandya started his day on a high with a decent bowling spell. Pandya bowled three overs in the match and conceded just 21 runs, and accounted for the wicket of Parthiv Patel. But his greater contribution came in the run chase when he won the match for his side. He hammered Pawan Negi for 21 runs in the penultimate over of the match to seal the fate of the game. Pandya remained unbeaten on 37 that came off mere 16 deliveries, with 5 fours and 2 sixes to his name. Rahul Chahar has been doing spin duties very well for the MI camp. He had a decent time with the ball in Mumbai yet again. Chahar was the preferred spinner in the match and he bowled his complete quota of 4 overs. He failed to pick up any wicket and conceded 31 runs, which looked relatively fine in the context of the game. Jason Behrendorff provided the ideal start to MI in the match. In the third over of the match, he got the big wicket of Virat Kohli. However, things turned sour for him thereafter. He finished the innings as the most expensive bowler in his side. In the four overs that he bowled, he conceded 49 runs. Also, he could not bag any other wicket in the later overs that he bowled. Veteran pacer Lasith Malinga made a comeback in the playing eleven for this game. He came in at the expense of Alzarri Joseph. He finished the innings as the pick of the bowlers for MI with 4/31 to his name. He bagged three wickets in the 20th over of the RCB innings. Earlier in the match, he had dismissed a well-set Moeen Ali to stall the RCB march. After being a tad off-colour in the last couple of games, Jasprit Bumrah looked in fine bowling form yet again. He bowled a maiden first up and was exceptional with the new ball. Although he failed to pick up any wicket, he looked in good control of his line and length. He finished 0/22 in his quota of 4 overs.